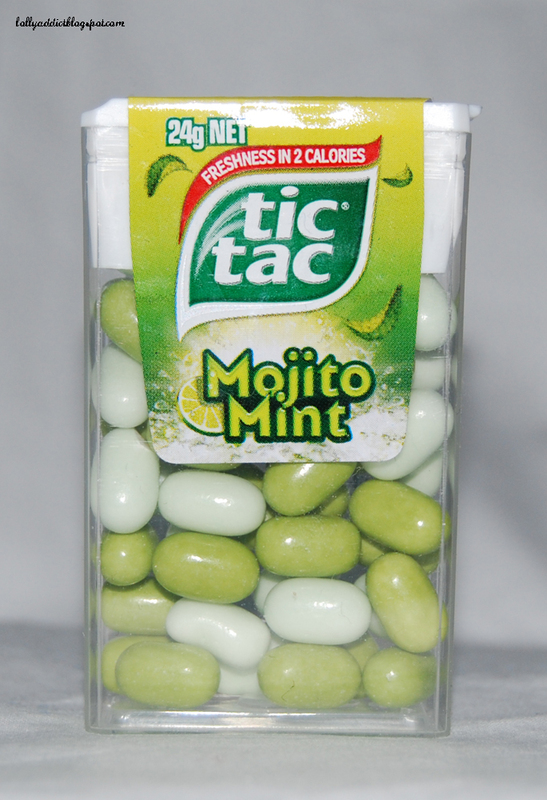 The description tells me they are on track at least, describing these new Tic Tacs as 'mint and lime flavoured mints'. 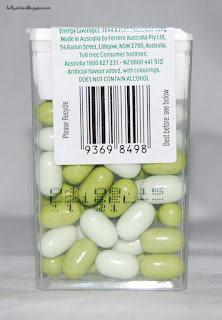 Even if 'mint-flavoured mints' makes me giggle a bit. The illustrations on the front depict mint leaves and wedges of lime, so we are looking pretty good. Each little mint is coloured either in a soft baby green, or an olive green. The later are lime (colour drawn from the colour of the rind), and the former mint (as a soft green is usually called mint green). The packet, when opened, has a mild mint scent, and the light green pieces have an equally mild flavour at first. What I love about these pieces is how true to real mint flavour they are. There's no artificial notes here; it tastes all natural, complete with the soothing natural coolness on the tongue. There is a mild touch of sugar, and the flavour is not extraordinarily strong, but these mints are really minty! The lime pieces don't reveal their true flavour until they are chewed. Like real limes, they are tangy almost to the point of face-scrunching, but not quite. Interestingly, these pieces also contain mint, which I wasn't expecting (even though it's in the name, duh). The lime flavour doesn't hang around long, leaving a much more intense mint flavour in its wake. Eaten together, the lime is quick to overpower the mint piece, but the two types of mint intermingle nicely for a mouth of freshness. Colour me surprised, but these make a pretty good case for mojito flavour! 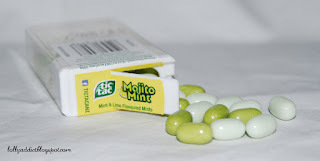 Unlike some other flavours of Tic Tac I've reviewed, these are still definitely mints. The lime pieces don't do much for me, but I could demolish a box of the mint ones by themselves. Together they do taste like the cocktail (minus the alcohol unfortunately) and now I'm longing for summer. I'd love to know if the mint pieces contained natural peppermint oil. 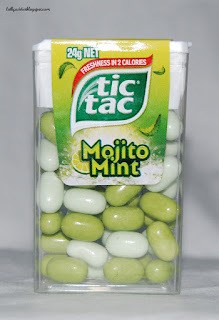 Tic Tac Mojito Mint are made in Australia. There's no official ingredients list for this flavour, but the ingredients for peppermint Tic Tac include rice.